From what The Cable Gamer remembers of her journalism classes, the fact that Don Lemon and a screaming panel are “awaiting” something—anything—is not news. Neither is it “breaking.” It’s empty calories: the cable equivalent of click-bait, something to keep the rubes tuned in. Never mind stranded people, flooded cities—that all becomes instantly irrelevant when one can sit and spent hours on political speculation about an apology that no one has seen or heard. Yes, wait till you see the ratings. The whole point of click-bait programming, right Mr. Media Critic? Of course Fox focused on the hurricane, just as CNN had been doing, because it was news. Stelter somehow forgot to note that Fox did break from hurricane coverage to cover the apology and followed up with multiple discussions and analyses of its ramifications. But again, that was after it was released and the participants knew what they were talking about. Bottom line: CNN’s media expert cheap-shotted Fox News as he spun the company line in defense of their empty-calories programming. That’s considered journalism in Zuckertown. “The Real Story” was the network’s lowest-rated program in both June and in the second quarter among the key demo. Carlson’s show has now lost to CNN more than any other FNC program since the network’s new lineup changes took effect back in October 2013. What spurred Mr. Flood to make the headlined statement was the first half of today’s Reliable Sources, entirely devoted not to coverage of the Dallas ambush or police shootings or Hillary Clinton’s emails. Only one topic was discussed in the first 30 minutes: Gretchen Carlson’s lawsuit against Roger Ailes. Needless to say there was no one to represent the defense though there were multiple prosecutors, including a women’s activist, a gentleman from NPR, and the man of a thousand “sources,” Gabe Sherman. (The Cable Gamer cringed to hear David Zurawik say of Sherman “he does good work, he’s a good reporter”—readers of this site know better.) So Sherman was free to cite the allegations from his “incredibly credible” anonymous sources without challenge. We have to wonder how heavily the hand of Jeff Zucker plays into this program. Some industry watchers have suggested host Brian Stelter carries water for his boss, and that might explain why, after a week of tumultuous, worldwide-headline news in America, Reliable Sources put all that on the back burner to spend time taking shots at a competitor. STELTER: I don’t know if FOX News viewers even knew about these police shootings in detail. What a preposterous, utterly baseless thing for a “media reporter” to say…unless he still hadn’t made his quota of cheap shots against Fox News. 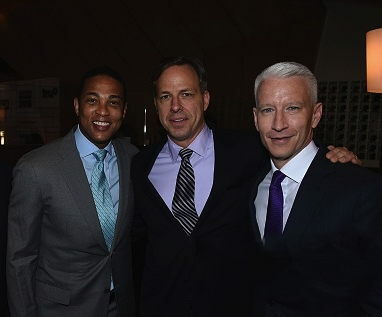 There was also a segment picking apart an interview Don Lemon did with Joe Walsh. Through the entire discussion Brian Stelter managed to make no mention whatsoever that both Lemon and CNN’s Charles Blow erroneously accused Walsh (after he had left) of something he clearly didn’t do. Reliable Sources would have been a good place to correct the record, but CNN doesn’t like to turn a critical lens on the media when it involves one of their own. How much better to convert the first half of the show into a jeremiad against FNC so untiringly one-sided that one of the top media reporters in the country calls it “declaring war on Fox News.” If, as the saying goes, “all war is based on deception,” then Jeff Zucker has his general in Brian Stelter. Where Have You Gone, Mr. Peabody? OPERATION TRUMP: Inside the most unorthodox campaign in political history. A lengthy article goes into excruciating detail about the Trump effort, and it’s clear that Sherman’s new-found status as chief engineer on the Trump Train may have given him actual, non-fictional sources, mainly The Man himself. The article is peppered with quotes from The Donald: “Trump told me,” “he told me,” “he said of Rubio,” “Trump said,” “he said,” “Trump shouted,” “he said,”—no way is anyone going to critique Sherman for fuzzy anonymous sources this time. Lewis hired Judd Burstein, a powerhouse litigator, and claimed he had “bombs” that would destroy Ailes and Fox News. That’s when Trump got involved. “When Roger was having problems, he didn’t call 97 people, he called me,” Trump said. Burstein, it turned out, had worked for Trump briefly in the ’90s, and Ailes asked Trump to mediate. Trump ran the negotiations out of his office at Trump Tower. “Roger had lawyers, very expensive lawyers, and they couldn’t do anything. I solved the problem.” Fox paid Lewis millions to go away quietly, and Trump, I’m told, learned everything Lewis had planned to leak. If Ailes ever truly went to war against Trump, Trump would have the arsenal to launch a retaliatory strike. Is this Trump’s “Trump card” against Fox? What dirt does Donald Trump have on Roger Ailes? Fox paid Lewis millions to go away quietly, and Trump, I’m told, learned everything Lewis had planned to leak. “I’m told.” Passive voice: one of the greatest fact-avoidance tools in the English language. “Rocks were thrown.” “Mistakes were made.” “I was told.” Funny that should turn up in the one paragraph that got so many media headlines. This matter-of-fact reversion to an unknown source, without even a description (e.g. “a high-level source in the Trump campaign”) to give it a fig leaf of verisimilitude, has been pretty much ignored by all the people promoting Sherman’s claim. STELTER: Well, these are clearly sources that were in the room with Roger Ailes. You know, authors like Gabriel Sherman don’t make up this stuff. STELTER: We’ve seen a lot of anonymous sources and I wonder if there’s any way around that. Because when readers and viewers hear anonymous sources, they’re very skeptical. They wonder if they should trust the information. OK, this might explain why Fox News talent such as Bill O’Reilly, Sean Hannity, Greta Van Susteren and all of Fox and Friends appear to big Trump supporters. But, Fox News is one of the few networks to call Trump out. The network did release a public statement against Trump and his attacks on Megyn Kelly. What dirt does Donald Trump have on Jeff Zucker? That’s what we want to know. Be as specific as possible. Negotiate hard with your source to agree a description that is sufficiently precise to enable readers to trust the reliability of our anonymous sourcing. “A source” or “sources”, “observers” or “quarters” with no further description is vague and unacceptable. Thanks to the passive voice, Sherman didn’t even give us “a source” or “observers.” No descriptors necessary! Trump has been playing Mr. Peabody to Gabriel Sherman for months now. 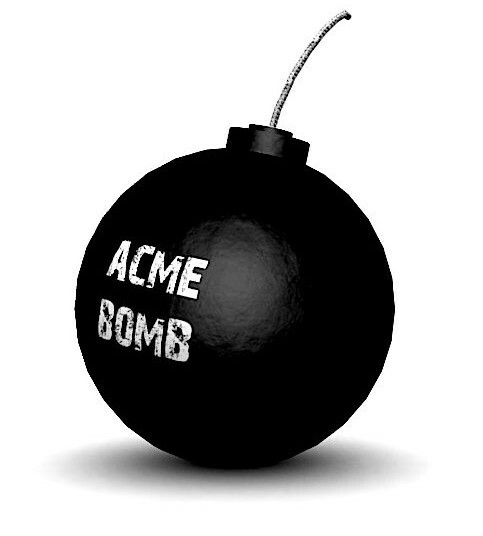 And if that’s where the story about “bombs” came from it’s obvious why Sherman wouldn’t want readers to know: Donald Trump’s rep for honesty and truthfulness is pitiful at best. Who’d believe him? Sherman desperately needs a better, more trustworthy Peabody. Too bad the original is unavailable, being a dog—and a cartoon dog at that. 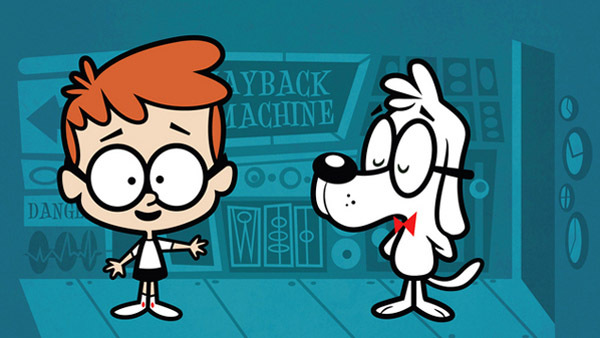 Mr. Sherman could use a man like Mr. Peabody again. GREAT MINDS UPDATE: Moments after publishing, The Cable Gamer learned that Erik Wemple of the post had just written an article tackling this same subject. Recommended reading. 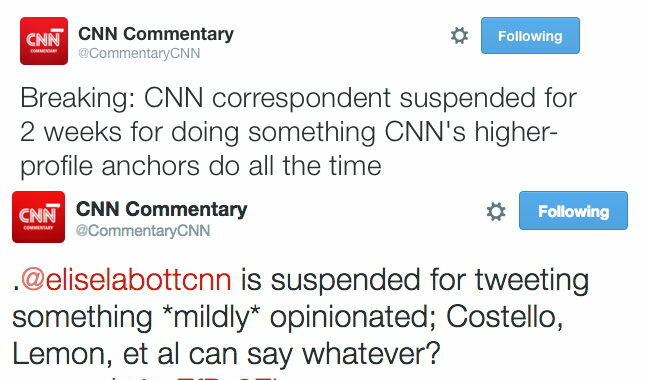 Evenhandedness, mind you, isn’t just a matter of journalistic principle for CNN. It’s a business imperative. Competitors Fox News and MSNBC are “two partisan networks, that are looking out for their viewers,” CNN Worldwide President Jeff Zucker has said. That split, he has argued, makes CNN ever more “essential” to viewers. Compared to Elise Labott’s pictorial rhetoric, Chris Cuomo’s language is far more pointed and partisan. “Your ideas are the problem…Reason over fear and hate…” Cuomo’s viewpoint is not implied via sentimental imagery but stated unambiguously, complete with personal comments about those who disagree with him. In record time Elise Labott gets suspended for two weeks, but somehow that never happens to Chris Cuomo. Zero-tolerance enforcement is applied sparingly when it comes to the marquee names, the people favored by the higher-ups. Sorry Elise. It’s not fair. It’s Zuckertown. 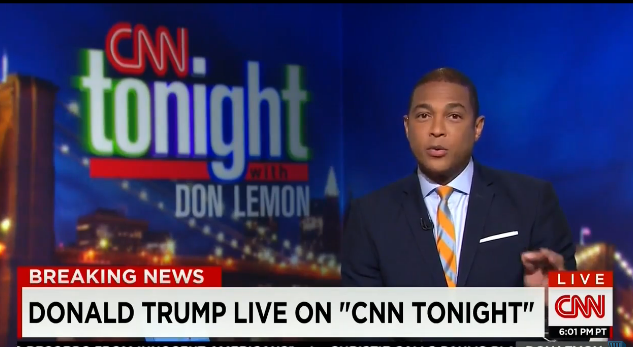 Friday night Don Lemon invited Donald Trump on CNN’s air, and the fallout from Trump’s volley of personal attacks on Megyn Kelly (and others) is still reverberating tonight. What was going on with the invite, the interview, and the fallout? And how did half of a quote vanish? Friday morning it was already known that Trump was embarking on a jihad against Fox News and Megyn Kelly in particular. LEMON: Do you think, because you mentioned Fox, do you think there was an agenda on the part of Fox News to target you? And if you do, why is that? TRUMP: I don’t have a lot of respect for Megyn Kelly, she’s a lightweight and, you know, she came out there reading her little script and trying to, you know, be tough and be sharp. And when you meet her, you realize she is not very tough and she is not very sharp. She is zippo. But she came out and, you know, I’m sitting there. I’m standing there. I knew there it was going to be a big crowd because I always have. LEMON: Well, let’s talk about Megyn Kelly because you brought her up. She did push you, pushed a lot of people, but what is it with you and Megyn Kelly? TRUMP: …she starts asking me all sorts of ridiculous questions, and you know, you can see there was blood coming out of her eyes, blood coming out of her—wherever, but she was, in my opinion, she was off base. LEMON: I have to ask you and I’m wondering if you think that Fox stacked the deck against you? LEMON: Would you do another Fox debate again? LEMON: So then would you do another Fox debate or would you drop out if there is another Fox debate? LEMON: Do you worry that it undermines you’re a tough guy and there’s a I’m going to stand up to Putin, to China, to Mexico et cetera yet your demeanor might suggest, it might suggest, to people that you are thin-skinned? LEMON: Donald Trump, you’re welcome to come co-host with me any time and we thank you for joining us. Trump went deep into the gutter attacking Kelly when he talked to CNN… Journalism organizations should condemn such a personal attack on a journalist who is doing her job… It is not political correctness that should push us to demand an apology, it is decency. Don Lemon certainly did none of that. He instigated Trump, but didn’t push back. (Lemon’s weak reference to Megyn Kelly as “respected” late in the interview was ineffectual and was without reference to Trump’s ugly slur.) He made no statement of support for Megyn Kelly either for himself or on behalf of CNN. Heaven forbid CNN gets on Trump’s bad side; he might not phone in his Sunday show appearance. Maybe if we’re lucky by tomorrow morning Brian Stelter will restore the rest of Trump’s quote.